The Vancouver Canucks have played 8 games, or basically 10% of their 82-game regular season schedule. While it’s not the best sample size, it’s a sample size nonetheless. More importantly, it makes for some easy math that I can do without a calculator. Now, no one in his/her right mind would suggest that by simply multiplying all of the Canucks’ stats so far by 10 that we’d come up with accurate season-end predictions. Thus, ahead of game #9 – here a few Things That Make You Go Hmmm. Will the Canucks make the playoffs? With 10 points in 8 games so far, the extrapolated total for the Canucks is 100 points. Looking at the last 5 full seasons (i.e. excluding the 2012-13 season), the average playoff bar is 94 points. So if the Canucks did indeed finish with 100 points, they would safely make the playoffs and likely finish anywhere between 4th and 6th. Much like all the extrapolations I’m going to do in this post, this prediction is severely flawed. The Canucks haven’t played the California power-houses yet (Los Angeles, San Jose, and Anaheim) or Chicago and the surprising Nashville Predators. Let’s see where they are on November 10 after returning home from California. Will the Sedins get 100 points each? Likely not, but it’s sure nice to see Daniel at 11 points and Henrik at 10 points after 8 games. There was a lot of talk before the season about the twins needing a combined 150 points for the Canucks to be remotely competitive. Whether it’s the new coach, new deployment, or new found confidence, the Sedins have looked dangerous so far. I realize that a 100-point extrapolation doesn’t really factor in injuries. Ah…who are we kidding? The biggest factor in the twins’ resurgence has been Radim Vrbata. The “man who has never met a shooting angle that he doesn’t like” also has 10 points after 8 games, including 5 goals. That means a potential 50-goal season. 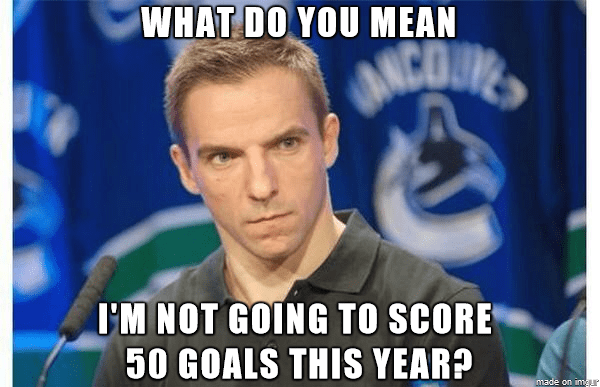 That too is unlikely given his career-high is 35 goals, but the Canucks signed Vrbata counting on him pitching in between 25-35 goals this year. Can Ryan Miller win 50 games? In 6 starts, Miller has an impressive 5-1 record; and his GAA of 2.58 is slightly bloated because of his poor showing in Dallas. Otherwise, he has provided the Canucks with solid and calm goaltending thus far. From a physical and mental standpoint, 60 games is not out of the question for Miller. He’s had seasons of 63, 76, 59, 69, 66, 61, and 59 games played. So we know he can do it. The bigger question is how the Canucks’ coaches will deploy likable back-up Eddie Lack. Lack’s numbers so far aren’t great, but we must realize that he was put into 2 tough games: both back to backs (one against Tampa Bay and the other against Colorado). Lack’s numbers will inevitably get better. But he’ll have to stay sharp given that he may likely only get 20-25 games this year. Will the goals slow down? After 8 games, the Canucks have scored 27 goals and allowed 26 goals. Extrapolated, that would give the Canucks 270 goals for the season while allowing 260 goals. Both totals are quite gaudy: the 270 goals would be their highest total since the 2009-2010 season – and a whopping 74-goal increase over last year. Similarly, the 260 goals allowed would be unheard of for the Canucks. In fact, only 4 teams in the entire NHL allowed at least 260 goals last season. The goals for is more realistic than the goals against, as the latter includes the drubbings in Dallas and Colorado. By the time the smoke settles, I see the Canucks scoring between 230-240 goals and allowing between 210-220. How do you minimize the minuses? After 6 games, Kevin Bieksa and Shawn Matthias are -6 and Jannik Hansen is -5. At this rate, the math suggests – even if logic does not – that Bieksa and Matthias will finish at -60 and Hansen -50. This obviously won’t happen. At least it better not. Luca Sbisa is on pace for 276 horrible giveaways. That’s it? 276 seems pretty reasonable all things considered.